Place chicken and thyme in 13x9-inch glass baking dish. 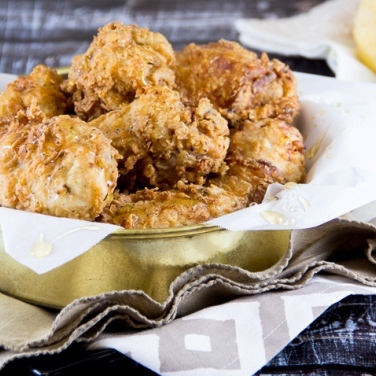 Pour buttermilk over chicken; stir until chicken is coated. Cover and refrigerate overnight. Heat oil in deep fryer to 350°F. Prepare a rack to drain the chicken by placing on a cookie sheet lined with paper towels; set aside. In a large resealable plastic bag, combine flour, garlic powder, marjoram, salt, thyme, pepper, sage and paprika. Lift chicken from buttermilk, letting excess buttermilk drain back into the baking dish. Add several pieces of chicken at a time to the bag of seasoned flour. Shake gently to coat. Remove coated chicken, dip again in reserved buttermilk. Repeat shaking in flour mixture to get a thick coating. Place chicken pieces in a single layer in deep fryer basket and carefully lower basket into the preheated oil. Fry chicken until meat thermometer has reached 165°F and coating is golden brown (about 15 minutes). Transfer chicken to rack to drain.